Hundreds of Thai protesters took to the streets of Bangkok Sunday to demonstrate against last week’s coup, in open defiance of martial law imposed in the capital. Soldiers arrested at least three protesters, injuring one, after hundreds gathered at Ratchdamri Avenue in central Bangkok. More demonstrators arrive at the scene after news and video of the arrests circulate on social media, prompting troops to retreat temporarily to avoid larger confrontation. The protesters then marched from Ratchadamri Road toward Victory Monument, where a similar protest had taken place Saturday, witnesses said. 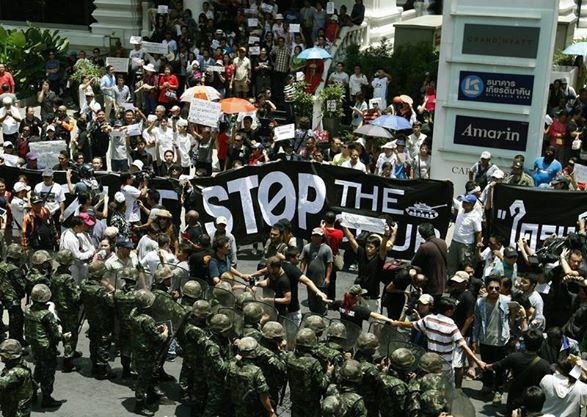 Thailand’s junta warned people not to join protests. “We want to create confidence in Thailand’s stability in the eyes of the international community,” National Peace and Order Maintaining Council spokesman Colonel Winthai Suwaree said in a televised broadcast. The statement followed a protest of several hundred people in Bangkok Saturday that led to a standoff with soldiers and police, but no violence. Martial law prohibits all political gatherings of more than five people. Army chief General Prayuth Chan-ocha seized power with a coup d’etat on Thursday and placed the country under martial law, detaining at least 150 politicians, activists and scholars over the past three days. On Saturday, the junta dissolved the Senate, strengthening Prayuth’s legislative powers as sole ruler of the nation. “He wants to consolidate power in order to handle the security situation,” said Panitan Wattanayagorn, a political scientist at Chulalongkorn University. After Thailand’s last coup in 2006, the military was quick to appoint a prime minister and set up an interim government to run the country, but Prayuth has not yet announced a schedule for doing so. The coup has drawn criticism from the United Nations and Thailand’s close allies such as the EU and US. The US military announced the cancellation of joint exercises with Thailand after cancelling 3.5 million dollars in military assistance on Friday. “It is important that the Royal Thai Armed Forces end this coup and restore to the people of Thailand both the principles and the process of democratic rule, including a clear path forward to elections,” Pentagon press secretary Rear Admiral John Kirby said in Washington. Thailand and the US have enjoyed close military ties since the Vietnam War, when the Asian kingdom was allied with US forces and hosted their military bases on its soil. “While we have enjoyed a long and productive military-to-military relationship with Thailand, our own democratic principles and US law require us to reconsider US military assistance and engagements,” Kirby said. The Pentagon canceled this year’s exercises as well as planned visits in June by US Pacific Fleet Commander Admiral Harry Harris to Thailand and Thai Armed Forces Commander General Tanasak Patimapragorn to the US Pacific Command.